WASHINGTON – As part of a combined $1.3 billion settlement with federal and state government partners, the U.S. Department of the Treasury’s Office of Foreign Assets Control (OFAC) announced three separate agreements totaling $611 million with the following UniCredit Group banks: UniCredit Bank AG in Germany, UniCredit Bank Austria AG in Austria, and UniCredit S.p.A. in Italy. The settlements resolve OFAC’s investigations into apparent violations of a number of U.S. sanctions programs, including those related to weapons of mass destruction proliferation. Specifically, between January 2007 and December 2011, UniCredit Bank AG processed over 2,000 payments totaling over $500 million through financial institutions in the United States in apparent violation of multiple U.S. sanctions programs. During this time period, UniCredit operated U.S. dollar accounts on behalf of the Islamic Republic of Iran Shipping Lines (IRISL) and several companies owned by or otherwise affiliated with IRISL, and managed the accounts of those companies in a manner that obscured the interest or involvement of IRISL in transactions sent to or through U.S. intermediaries. For a number of years up to and including 2011 (UniCredit Bank AG) and 2012 (UniCredit Bank Austria AG and UniCredit Bank S.p.A.), all three banks processed payments to or through the United States in a manner that did not disclose underlying sanctioned persons or countries to U.S. financial institutions which were acting as financial intermediaries. These transactions constitute apparent violations of contemporaneous sanctions programs targeting proliferators of weapons of mass destruction, global terrorism, and the following countries: Burma, Cuba, Iran, Libya, Sudan, and Syria. Pursuant to the settlement agreements, each bank is required to implement and maintain compliance commitments designed to minimize the risk of the recurrence of the conduct giving rise to the apparent violations. The full set of commitments are identified in each of the banks’ public settlement agreements (UniCredit Bank AG [LINK], UniCredit Bank Austria AG [LINK], UniCredit S.p.A. [LINK]) and focus on areas that led to the apparent violations, including (1) a commitment from senior management to promote a “culture of compliance” throughout each organization, (2) a commitment that each bank implements internal controls that adequately address the results of its OFAC risk assessment and profile, and (3) a commitment to providing adequate training to support each bank’s OFAC compliance efforts. OFAC worked closely and collaboratively with its counterparts at other government agencies in the course of these investigations. Today’s settlements are being announced in conjunction with actions involving the U.S. Department of Justice, the New York County District Attorney’s Office, the Federal Reserve Board of Governors, and the Department of Financial Services of the State of New York. The banks’ obligations to pay OFAC such settlement amounts were deemed satisfied up to an equal amount by payments in satisfaction of penalties assessed by U.S. federal officials arising out of the same patterns of conduct during the same time periods. UniCredit Bank AG will remit $105,876,230 to OFAC to settle civil liability relating to the apparent violations. View settlement agreements: UniCredit Bank AG, UniCredit Bank Austria AG, UniCredit S.p.A..
Gibran Rodriguez-Mejia, 31, was extradited from Mexico to San Diego in September 2018, and is the fifth Mexican-based defendant in this case to enter a guilty plea, doing so before U.S. Magistrate Judge Mitchell D. Dembin. Rodriguez-Mejia will be sentenced on July 8, 2019 before U.S. District Judge Roger T. Benitez. Through his plea agreement, Rodriguez-Mejia admitted to laundering $3.5 million in drug proceeds. He coordinated with couriers, primarily located in Southern California, who smuggled the bulk of U.S. currency from the United States to Mexico. Rodriguez-Mejia also admitted that he arranged for currency to be smuggled to an exchange house in Tijuana, Mexico owned and operated by co-defendant Cesar Hernandez-Martinez, who pleaded guilty on April 4, 2019 and will be sentenced on July 8, 2019. After the money was converted to Mexican pesos, Rodriguez-Mejia provided financial accounts in Mexico into which the money was deposited for the benefit of the Mexican-based cartel drug traffickers. In addition to the five defendants in this case, approximately 20 other individuals have entered guilty pleas and have been previously sentenced in related cases. Those cases have involved individuals based in the United States or individuals who have frequently crossed into the United States and served as money couriers, drug couriers and drug stash-house operators and who were part of, or related to, the same money laundering and drug trafficking organization. Omar Ayon-Diaz, Osvaldo Contreras-Arriaga and Joel Acedo-Ojeda have also pleaded guilty in this case and have been sentenced to 120 months, 132 months and 135 months in prison, respectively. The U.S. Census Bureau and the U.S. Bureau of Economic Analysis announced that the goods and services deficit was $49.4 billion in February, down $1.8 billion from $51.1 billion in January, revised. February exports were $209.7 billion, $2.3 billion more than January exports. February imports were $259.1 billion, $0.6 billion more than January imports. 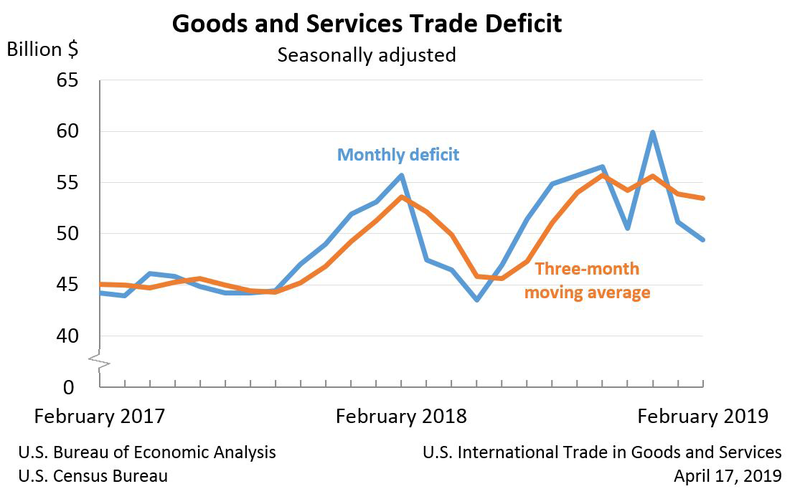 The February decrease in the goods and services deficit reflected a decrease in the goods deficit of $1.2 billion to $72.0 billion and an increase in the services surplus of $0.5 billion to $22.6 billion. Year-to-date, the goods and services deficit decreased $8.3 billion, or 7.6 percent, from the same period in 2018. Exports increased $11.1 billion or 2.7 percent. Imports increased $2.8 billion or 0.5 percent. The average goods and services deficit decreased $0.4 billion to $53.5 billion for the three months ending in February. Average exports increased $0.1 billion to $207.5 billion in February. Average imports decreased $0.3 billion to $261.0 billion in February. Year-over-year, the average goods and services deficit decreased $0.1 billion from the three months ending in February 2018. Average exports increased $3.8 billion from February 2018. Average imports increased $3.7 billion from February 2018. Exports of goods increased $2.1 billion to $139.5 billion in February. Exports of goods on a Census basis increased $1.9 billion. Capital goods increased $2.1 billion. Civilian aircraft increased $2.2 billion. Automotive vehicles, parts, and engines increased $0.6 billion. Industrial supplies and materials decreased $0.4 billion. Net balance of payments adjustments increased $0.2 billion. Exports of services increased $0.2 billion to $70.1 billion in February. Other business services, which includes research and development services; professional and management services; and technical, trade-related, and other services, increased $0.1 billion. Imports of goods increased $0.9 billion to $211.6 billion in February. Imports of goods on a Census basis increased $0.8 billion. Consumer goods increased $1.6 billion. Cell phones and other household goods increased $2.1 billion. Other goods increased $0.5 billion. Industrial supplies and materials decreased $1.2 billion. Net balance of payments adjustments increased $0.1 billion. Imports of services decreased $0.3 billion to $47.5 billion in February. Travel (for all purposes including education) decreased $0.1 billion. Government goods and services increased $0.1 billion. The real goods deficit decreased $1.8 billion to $81.8 billion in February. Real exports of goods increased $0.8 billion to $150.7 billion. Real imports of goods decreased $0.9 billion to $232.5 billion. Exports of goods were revised up $0.1 billion. Exports of services were revised down less than $0.1 billion. Imports of goods were revised down less than $0.1 billion. Imports of services were revised up less than $0.1 billion. The February figures show surpluses, in billions of dollars, with South and Central America ($3.7), Hong Kong ($2.8), United Kingdom ($0.9), Brazil ($0.6), Singapore ($0.4), Canada ($0.4), and OPEC ($0.3). Deficits were recorded, in billions of dollars, with China ($30.1), European Union ($12.4), Mexico ($7.7), Japan ($6.7), Germany ($5.5), Italy ($2.8), South Korea ($2.4), India ($2.2), France ($2.2), Taiwan ($1.7), and Saudi Arabia ($0.3). The deficit with China decreased $3.1 billion to $30.1 billion in February. Exports increased $1.6 billion to $9.2 billion and imports decreased $1.5 billion to $39.3 billion. The surplus with Hong Kong increased $1.0 billion to $2.8 billion in February. Exports increased $0.9 billion to $3.2 billion and imports decreased $0.1 billion to $0.3 billion. The deficit with Japan increased $1.3 billion to $6.7 billion in February. Exports decreased $1.1 billion to $5.7 billion and imports increased $0.2 billion to $12.4 billion. Ying Lin pleaded guilty to acting as an agent of the People’s Republic of China (PRC), without notification to the Attorney General, by working at the direction and control of military officers assigned to the Permanent Mission of the People’s Republic of China to the United Nations. Lin, a former manager with an international air carrier headquartered in the PRC (the Air Carrier), abused her privileges to transport packages from John F. Kennedy International Airport (JFK Airport) to the PRC aboard Air Carrier flights at the behest of the PRC military officers and in violation of Transportation Security Administration (TSA) regulations. The proceeding was held before United States District Judge Ann M. Donnelly. Assistant Attorney General for National Security John C. Demers, U.S. Attorney Richard P. Donoghue for the Eastern District of New York, Assistant Director in Charge William F. Sweeney, Jr of the FBI’s New York Field Office, and Special Agent in Charge Angel M. Melendez, Department of Homeland Security, Homeland Security Investigations (HSI) announced the guilty plea. Lin worked for the Air Carrier from 2002 through the fall of 2015 as a counter agent at JFK Airport and from the fall of 2015 through April 2016 as the station manager at Newark Liberty International Airport. During her employment with the Air Carrier, Lin accepted packages from the PRC military officers, and placed those packages aboard Air Carrier flights to the PRC as unaccompanied luggage or checked in the packages under the names of other passengers flying on those flights. As the PRC military officers did not travel on those flights, Lin’s actions were contrary to a security program that required that checked baggage be accepted only from ticketed passengers, thereby violating TSA regulations. In addition, Lin encouraged other Air Carrier employees to assist the PRC military officers, instructing those employees that because the Air Carrier was a PRC company, their primary loyalty should be to the PRC. In exchange for her work at the direction and under the control of PRC military officers and other PRC government officials, Lin received benefits from the PRC Mission and PRC Consulate in New York. These benefits included tax-exempt purchases of liquor, cigarettes and electronic devices worth tens of thousands of dollars. These benefits also included free contracting work at the defendant’s two residences in Queens, New York, by PRC construction workers who were permitted under the terms of their visas to work only on PRC government facilities. When sentenced, Lin faces up to 10 years’ imprisonment. As part of the guilty plea, Lin agreed to forfeit approximately $25,000 as well as an additional $145,000 in connection with her resolution of the government’s forfeiture verdict in United States v. Zhong, No. 16-CR-614 (AMD). Mr. Demers and Mr. Donoghue expressed their appreciation to the Transportation Security Administration for their assistance on the case. The government’s case is being handled by the National Security and Cybercrime Section. Assistant United States Attorneys Douglas M. Pravda, Alexander A. Solomon, Ian C. Richardson and Sarah M. Evans are in charge of the prosecution, with assistance from Trial Attorney Matthew R. Walczewski of the Department of Justice’s Counterintelligence and Export Control Section. The forfeiture aspect of the case is being handled by EDNY Assistant United States Attorney Brian Morris of the Office’s Civil Division. Assistant Attorney General Brian A. Benczkowski of the Justice Department’s Criminal Division, U.S. Attorney Nicholas A. Trutanich of the District of Nevada and Special Agent in Charge Aaron C. Rouse of the FBI’s Las Vegas Division made the announcement. Junzo Suzuki, 70, and Paul Suzuki, 40, who are father and son and are both Japanese nationals, were each charged in a July 2015 indictment filed in the District of Nevada with eight counts of mail fraud and nine counts of wire fraud. Japanese authorities arrested the Suzukis in January 2019 at the request of the United States, and extradited them to the United States on April 17. The Suzukis will make their initial appearance this afternoon before U.S. Magistrate Judge Cam Ferenbach of the District of Nevada. According to the indictment, Junzo Suzuki previously was executive vice president for Asia Pacific of MRI International (MRI), an investment company which was headquartered in Las Vegas and had an office in Japan. Paul Suzuki previously was the company’s general manager for Japan operations, based in Tokyo. MRI purportedly specialized in “factoring,” whereby the company purchased accounts receivable from medical providers at a discount, and then attempted to recover the entire amount, or at least more than the discounted amount, from the debtor. According to allegations in the indictment, from at least 2009 to 2013, the Suzukis and their co-defendant Edwin Fujinaga, 72, of Las Vegas, fraudulently solicited investments from thousands of Japanese residents. When MRI collapsed, it allegedly owed investors over $1.5 billion. Specifically, the indictment alleges that Fujinaga and the Suzukis promised investors a series of interest payments that would accrue over the life of the investment and that would be paid out along with the face value of the investment at the conclusion of the investments’ duration. The defendants allegedly solicited investments by, among other things, promising investors that their investments would be used only for the purchase of medical accounts receivable (MARS) and by representing that investors funds would be managed and safeguarded by an independent third-party escrow company. The indictment further alleges that MRI operated as a Ponzi scheme, in which the defendants used new investors’ money to pay prior investors’ maturing investments. According to the indictment, the defendants also allegedly used investors’ funds for purposes other than the purchase of MARS, including paying themselves sales commissions, subsidizing gambling habits, funding personal travel by private jet and other personal expenses. A federal jury convicted two Bucharest, Romania, residents of 21 counts related to their scheme to infect victim computers with malware in order to steal credit card and other information to sell on dark market websites, mine cryptocurrency and engage in online auction fraud, announced Assistant Attorney General Brian A. Benczkowski of the Justice Department’s Criminal Division and U.S. Attorney Justin E. Herdman of the Northern District of Ohio. According to court documents, over the course of almost 10 years, UCB AG knowingly and willfully moved at least $393 million through the U.S. financial system on behalf of sanctioned entities, most of which was for an entity the U.S. Government specifically prohibited from accessing the U.S. financial system. UCB AG engaged in this criminal conduct through a scheme, formalized in its own bank polices and designed to conceal from U.S. regulators and banks the involvement of sanctioned entities in certain transactions. UCB AG routed illegal payments through U.S. financial institutions for the benefit of the sanctioned entities in ways that concealed the involvement of the sanctioned entities, including through the use of companies that UCB AG knew would appear unconnected to the sanctioned entity despite being controlled by the sanctioned entity. "This case is a prime example of how some institutions erroneously believe they can game the U.S. financial system and conceal their nefarious activity,” said Assistant Director in Charge Sweeney. "The FBI will root out and aggressively investigate institutions, like UCB AG, that conspire to violate U.S. sanctions on behalf of prohibited entities." UCB AG will waive indictment and be charged in a one-count felony criminal information, according to documents to be filed in federal court in the District of Columbia, charging UCB AG with knowingly and willfully conspiring to commit violations of IEEPA and to defraud the United States, from 2002 through 2011. UCB AG has agreed to plead guilty to the information, has entered into a written plea agreement and has accepted responsibility for its criminal conduct. UCB AG will enter its guilty plea before a judge in the District of Columbia. UniCredit Group banks will pay total financial penalties of approximately $1.3 billion. The plea agreement, subject to approval by the court, provides that UCB AG will forfeit $316,545,816 and pay a fine of $468,350,000. According to admissions in the non-prosecution agreement and accompanying statement of facts, between 2002 and 2012, BA used non-transparent methods to send payments related to sanctioned jurisdictions such as Iran through the United States. BA conspired to violate IEEPA and defraud the United States by processing transactions worth at least $20 million through the United States on behalf of customers located or doing business in Iran and other countries subject to U.S. economic sanctions or customers otherwise subject to U.S. economic sanctions. As a result of its crimes, BA will forfeit $20 million and has agreed to additional compliance and sanctions enhancements. In addition, UCB AG has entered into a plea agreement with the New York County District Attorney’s Office (DANY) for violating New York State law pursuant to which it will pay $316,545,816. BA has also entered into a non-prosecution agreement with DANY for violating New York State law. DANY conducted its own investigation alongside the Justice Department. UniCredit SpA, UCB AG and BA have also entered into various settlement agreements with the U.S. Department of the Treasury’s Office of Foreign Assets Control (OFAC), the Board of Governors of the Federal Reserve System (the Federal Reserve) and the New York State Department of Financial Services (DFS) under which they will pay additional penalties of approximately $660 million as follows: $611,023,421 to OFAC, which will be satisfied in part by payments to the Justice Department and the Federal Reserve, $157,770,000 to the Federal Reserve and $405 million to DFS. The case was prosecuted by Senior Trial Attorney Margaret A. Moeser of the Bank Integrity Unit in the Criminal Division’s Money Laundering and Asset Recovery Section, and Assistant U.S. Attorney Michelle Zamarin of the District of Columbia. The case was investigated by the FBI and the IRS-CI. The Bank Integrity Unit investigates and prosecutes complex, multi-district, and international criminal cases involving financial institutions. The Unit’s prosecutions focus on banks and other financial institutions, including their officers, managers, and employees, whose actions threaten the integrity of the individual institution or the wider financial system. For Tax Year 2016, taxpayers filed 140.9 million individual income tax returns, excluding returns filed by dependents. The average adjusted gross income (AGI) reported on these returns was $72, 090, in comparison with $71,829 for the previous year. Total AGI increased slightly by 0.1 percent to $10.16 trillion, while total income tax decreased 0.8 percent to $1.44 trillion. For 2016, the AGI threshold for the top 50 percent of all individual income tax returns was $40,078 for the year. These taxpayers accounted for 88.4 percent of total AGI, and paid 97 percent of total income tax. The top 0.001 percent of tax returns had an AGI of $53,052,900 or more. These taxpayers accounted for 2 percent of total AGI, and paid 3.2 percent of total income tax. The average tax rate of 14.2 percent for all returns in 2016 was the second highest of this 10-year study, Tax Year 2007-2016. For 2013, the threshold was $5.25 million or more in gross estate. In 2013, there were an estimated 584 thousand adults in the United States (U.S.) representing the top .25 percent of all adults in the population. Together, these top wealth holders owned nearly $7.3 trillion in assets and held $432 billion in debt, making their combined net worth $6.9 trillion. The Federal Reserve Board's Survey of Consumer Finance estimated the net worth of all U.S. adults to be $65.5 trillion in 2013. By this measure, 10.5 percent of the Nation's net worth was accounted for by these top wealth holders. For Tax Year 2017, taxpayers filed 153.1 million U.S. individual income tax returns, an increase of 1.8 percent from the 150.3 million returns filed for Tax Year 2016. For 2017, adjusted gross income (AGI) increased 7.1 percent to $10.9 trillion. This large increase in AGI was reflected in increases in most components of income, including increases in salaries and wages (5.0 percent), taxable pensions and annuities (5.5 percent), net capital gains (33.5 percent), partnership and S corporation net income less loss (4.8 percent), and ordinary dividends (13.4 percent). Bontiea Bernedette Goss, 63, her husband, Tommy Ray Goss, aka “Tom,” 63, both residents of Springfield, Missouri, and Boulder, Colorado, and Jeremy Young Hutchinson, 45, of Little Rock, Arkansas, were charged on March 29, 2019, in a 32-count indictment by a federal grand jury in Springfield, which was unsealed today. The indictment alleges that the Gosses, who were high-level executives at Preferred Family Healthcare Inc. (formerly known as Alternative Opportunities Inc.), and Hutchinson, who is an attorney and served as a state senator in the Arkansas Senate from 2011 to 2018, along with others, participated in a conspiracy from 2005 to November 2017 to embezzle and misapply the funds of a charitable organization that received federal funds, to pay bribes and kickbacks to elected officials (including Hutchinson), and to deprive the citizens of Arkansas of their right to the honest services of those elected officials. According to the indictment, in exchange for the bribes and kickbacks offered by the Gosses and other co-conspirators, Hutchinson and other elected officials allegedly provided favorable legislative and official action for the charity, including directing funds from the state’s General Improvement Fund (GIF). using charity funds to pay for personal services for themselves, including child and pet care, housekeeping and cleaning their personal residences, picking up and delivering groceries, and shoveling snow, among other personal services paid for by the charity. The indictment also contains a forfeiture allegation, which would require the Gosses and Hutchinson to forfeit to the government any property obtained from the proceeds of the alleged offenses. The charity was known as Alternative Opportunities Inc. from its founding in 1991 until its 2015 merger with Preferred Family Healthcare. The charity, which is cooperating with federal investigators, provided a variety of services to individuals in Arkansas, Illinois, Kansas, Missouri and Oklahoma, including mental and behavioral health treatment and counseling, substance abuse treatment and counseling, employment assistance, aid to individuals with developmental disabilities and medical services. An indictment contains only allegations. A defendant is presumed innocent until proven guilty beyond a reasonable doubt in a court of law. The settlement resolves a lawsuit brought in the United States Court of International Trade seeking recovery of unpaid antidumping duties and penalties under 19 U.S.C. § 1592 totaling $84 million plus interest. In that action, the government alleged that Univar was grossly negligent or negligent in failing to determine that its supplier in Taiwan was not a manufacturer but, instead, imported saccharin into Taiwan from China for transshipment to the United States. This is the largest recovery under section 1592 ever reached in the Court of International Trade. The settlement announced today was the result of an investigation by the U.S. Customs and Border Protection (CBP), Immigration and Customs Enforcement (ICE), and the Commercial Litigation Branch of the Justice Department’s Civil Division. The investigating ICE agent was Special Agent Patrick C. Deas. The case was handled by Commercial Litigation Branch Attorneys Patricia M. McCarthy, Stephen C. Tosini and Reta E. Bezak, and CBP Assistant Chief Counsel Currita C. Waddy.  As states began developing their own approaches to marijuana enforcement the Department of Justice issued guidance to support these state actions and focus law enforcement resources.  However, this guidance was withdrawn in 2018, causing legal uncertainty that severely limits these state laboratories of democracy, creates public health and safety issues, and undermines the state regulatory regimes.  As more states, territories, and tribes thoughtfully consider updates to marijuana regulations, often through voter-initiated referendums, it is critical that Congress take immediate steps to safeguard their right to do so. The Strengthening the Tenth Amendment Through Entrusting States (STATES) Act ensures that each State has the right to determine for itself the best approach to marijuana within its borders.  Amends the Controlled Substances Act (21 U.S.C. § 801 et seq.) (CSA) so that -- as long as states and tribes comply with a few basic protections -- its provisions no longer apply to any person acting in compliance with State or tribal laws relating to the manufacture, production, possession, distribution, dispensation, administration, or delivery of marijuana.  The bill does not alter CSA Section 417 (prohibition on endangering human life while manufacturing a controlled substance) and maintains the prohibition on employing persons under age 18 in marijuana operations, two federal requirements with which states, territories, and tribes must continue to comply.  The bill prohibits the distribution of marijuana at transportation safety facilities such as rest areas and truck stops (Section 409).  The bill does not allow for the distribution or sale of marijuana to persons under the age of 21 (Section 418) other than for medical purposes.  To address financial issues caused by federal prohibition, the bill clearly states that compliant transactions are not trafficking and do not result in proceeds of an unlawful transaction. The Department of Justice today announced that General Electric (GE) will pay a civil penalty of $1.5 billion under the Financial Institutions Reform, Recovery, and Enforcement Act of 1989 (FIRREA) to resolve claims involving subprime residential mortgage loans originated by WMC Mortgage (WMC), a GE subsidiary. WMC, GE, and their affiliates allegedly misrepresented the quality of WMC’s loans and the extent of WMC’s internal quality and fraud controls in connection with the marketing and sale of residential mortgage-backed securities (RMBS). FIRREA authorizes the federal government to seek civil penalties for violations of various predicate criminal offenses, including wire and mail fraud where the violation affects a federally insured financial institution. General Electric Capital Corporation (GECC), then the financial services unit of GE, acquired WMC, a subprime residential mortgage loan originator, in 2004. WMC originated more than $65 billion dollars in mortgage loans between 2005 and 2007. WMC sold the vast majority of its loans to investment banks, which, in turn, issued and sold RMBS backed by WMC loans to investors. The United States alleged that a majority of the mortgage loans WMC originated and sold for inclusion in RMBS in 2005-2007 did not comply with WMC’s representations about the loans, and that certain of WMC’s representations were reviewed by, approved by, or made with the knowledge of personnel from GE or GECC. Investors, including federally insured financial institutions, suffered billions of dollars in losses as a result of WMC’s fraudulent origination and sale of loans for inclusion in RMBS. In particular, the United States alleged that in 2005-2007, WMC attempted to increase its profits and meet profit goals by increasing originations. WMC loan analysts responsible for underwriting mortgage loans were encouraged to approve loans in order to meet volume targets, even where the loan applications did not meet the criteria outlined in WMC’s published underwriting guidelines, and received additional compensation based on the number of mortgages they approved. At the same time, there were significant deficiencies with respect to WMC’s quality control, which was viewed by some as an impediment to volume. In 2005, a WMC quality control manager described his department as a “toothless tiger” with inadequate resources and no authority to prevent the approval or sale of loans his department had determined were fraudulent or otherwise defective. The United States alleged that the investment banks that purchased WMC’s loans declined to buy certain mortgage loans that WMC attempted to sell due to defects in the loan file or suspected fraud. When it declined, or “kicked out” a loan, the potential purchaser typically notified WMC of its reasons for rejecting the file, including the defects identified. WMC’s general practice was to re-offer certain kicked loans to a second potential purchaser for inclusion in RMBS without disclosing that the mortgage had previously been rejected or the reasons why the first potential purchaser concluded the mortgage had defects. The United States alleged that by late 2005 and early 2006, investment banks were kicking out more of WMC’s loans than ever, and investors in RMBS backed by WMC loans raised concerns about the quality of loans originated by WMC because WMC borrowers were failing to repay their loans at unexpectedly high rates. WMC also began receiving increased numbers of requests from investment banks to buy back, or repurchase, loans. In March 2006, WMC reviewed a representative sample of the 1,276 loans it had repurchased in 2005, and concluded that 78 percent of the loan files reviewed contained at least one piece of false information. The results of this review were shared with WMC’s senior executive team and discussed on multiple occasions with personnel from GECC. The United States alleged that in fall 2006, GECC took control over the strategic direction of WMC. Even in the face of increasing repurchase demands, kick-outs, and concerns about WMC’s underwriting quality, WMC continued selling its loans and making false representations about their qualities and attributes. GECC became closely involved in WMC’s whole loan sales and provided WMC with input and direction on how to sell off WMC’s remaining loans. Beginning in 2007, GECC also assumed control over WMC’s ability to grant repurchase requests. The investigation of WMC, GE, and GECC and this settlement were handled by the Civil Division’s Commercial Litigation Branch, with assistance from the San Francisco Field Office of the Federal Bureau of Investigation. Cadwalder has posted an article about the SEC Division of Investment Management granting no-action relief, allowing certain Puerto Rico retirement plans to participate in "bank-maintained" collective trust funds without requiring the trust to register under the Investment Company Act, the Securities Act or the Exchange Act. One of the largest health care fraud schemes investigated by the FBI and the U.S. Department of Health and Human Services Office of the Inspector General (HHS-OIG) and prosecuted by the Department of Justice resulted in charges against 24 defendants, including the CEOs, COOs and others associated with five telemedicine companies, the owners of dozens of durable medical equipment (DME) companies and three licensed medical professionals, for their alleged participation in health care fraud schemes involving more than $1.2 billion in loss, as well as the execution of over 80 search warrants in 17 federal districts. In addition, the Center for Medicare Services, Center for Program Integrity (CMS/CPI) announced today that it took adverse administrative action against 130 DME companies that had submitted over $1.7 billion in claims and were paid over $900 million. Assistant Attorney General Brian A. Benczkowski of the Justice Department’s Criminal Division, U.S. Attorney Sherri A. Lydon of the District of South Carolina, U.S. Attorney Craig Carpenito of the District of New Jersey, U.S. Attorney Maria Chapa Lopez of the Middle District of Florida, Assistant Director Robert Johnson of the FBI’s Criminal Investigative Division, Deputy Inspector General for Investigations Gary Cantrell of the U.S. Department of Health and Human Services Office of Inspector General (HHS-OIG), Chief Don Fort of the IRS Criminal Investigation (CI) and Deputy Administrator and Director of CPI Alec Alexander of the CMS/CPI made the announcement. The charges announced today target an alleged scheme involving the payment of illegal kickbacks and bribes by DME companies in exchange for the referral of Medicare beneficiaries by medical professionals working with fraudulent telemedicine companies for back, shoulder, wrist and knee braces that are medically unnecessary. Some of the defendants allegedly controlled an international telemarketing network that lured over hundreds of thousands of elderly and/or disabled patients into a criminal scheme that crossed borders, involving call centers in the Philippines and throughout Latin America. The defendants allegedly paid doctors to prescribe DME either without any patient interaction or with only a brief telephonic conversation with patients they had never met or seen. The proceeds of the fraudulent scheme were allegedly laundered through international shell corporations and used to purchase exotic automobiles, yachts and luxury real estate in the United States and abroad. According to allegations in court documents, some of the defendants obtained patients for the scheme by using an international call center that advertised to Medicare beneficiaries and “up-sold” the beneficiaries to get them to accept numerous “free or low-cost” DME braces, regardless of medical necessity. The international call center allegedly paid illegal kickbacks and bribes to telemedicine companies to obtain DME orders for these Medicare beneficiaries. The telemedicine companies then allegedly paid physicians to write medically unnecessary DME orders. Finally, the international call center sold the DME orders that it obtained from the telemedicine companies to DME companies, which fraudulently billed Medicare. Collectively, the CEOs, COOs, executives, business owners and medical professionals involved in the conspiracy are accused of causing over $1 billion in loss. The Fraud Section leads the Medicare Fraud Strike Force. Since its inception in March 2007, the Medicare Fraud Strike Force, which maintains 14 strike forces operating in 23 districts, has charged nearly 4,000 defendants who have collectively billed the Medicare program for more than $14 billion. In addition, the HHS Centers for Medicare & Medicaid Services, working in conjunction with the HHS-OIG, are taking steps to increase accountability and decrease the presence of fraudulent providers. In the District of New Jersey, charges were brought against Creaghan Harry, 51, of Highland Beach, Florida; Lester Stockett, 51, of Deefield Beach, Florida; and Elliot Loewenstern, 56, of Boca Raton, Florida; the owner, CEO and VP of marketing, respectively, of purported call centers and telemedicine companies, for their alleged participation in a $454 million illegal health care kickback and international money laundering scheme related to the solicitation of illegal kickbacks and bribes in exchange for the referral of DME orders to DME providers. In addition, Joseph DeCoroso, M.D., 62, of Toms River, New Jersey, was charged in a $13 million conspiracy to commit health care fraud and separate charges of health care fraud for writing medically unnecessary orders for DME, in many instances without ever speaking to the patients, while working for two telemedicine companies. The cases are being prosecuted by Fraud Section Acting Assistant Chief Jacob Foster and Trial Attorney Darren Halverson. In the Middle District of Florida, charges were brought against Willie McNeal, 42, of Spring Hill, Florida, the owner and CEO of two purported telemedicine companies, for his alleged participation in a $250 million scheme related to the solicitation of illegal kickbacks and bribes in exchange for the referral of DME orders to DME providers. The case is being prosecuted by Fraud Section Acting Assistant Chief Jacob Foster and Trial Attorneys John Michelich, Catherine Wagner and Sara Clingan. In the Northern District of Texas, charges were brought against Leah Hagen, 48, and Michael Hagen, 51, of Dalworthington Gardens, Texas, owners and operators of two DME companies, for their alleged participation in a $17 million illegal health care kickback scheme related to the payment of kickbacks in exchange for the referral of medically unnecessary DME orders. The case is being prosecuted by Fraud Section Trial Attorneys Brynn Schiess and Carlos Lopez. In the Western District of Texas, Christopher O’Hara, 54, of Kingsbury, Texas, the owner of a purported telemedicine company, was charged in an $40 million scheme related to the alleged solicitation of illegal kickbacks and bribes in exchange for the referral of DME orders to DME providers. The case is being prosecuted by Fraud Section Trial Attorney Kevin Lowell. In the Eastern District of Pennsylvania, Randy Swackhammer, M.D., 60, of Goldsboro, North Carolina, was charged for an alleged $5 million conspiracy to commit health care fraud that involved writing medically unnecessary orders for DME while working for a telemedicine company, in many instances with only a brief telephonic conversation with the patients. The case is being prosecuted by Fraud Section Trial Attorney Adam Yoffie. In the Central District of California, charges were brought against Darin Flashberg, 41, of Glendora, California, and Najib Jabbour, 47, of Glendora, California, owners of seven DME companies, for their alleged participation in a $34 million scheme related to their payment of kickbacks and bribes in exchange for medically unnecessary DME orders. The case is being prosecuted by Fraud Section Trial Attorney Robyn Pullio. In addition to the Strike Force prosecutions, other enforcement actions were taken, including the execution of search warrants to support related investigative efforts in seven additional U.S. Attorney’s Offices to include in various investigations conducted by the District of New Jersey, District of South Carolina, Southern District of California, District of Nebraska, Middle District of Florida, Eastern District of Missouri and Western District of Washington. In the District of South Carolina, charges were brought against Andrew Chmiel, 43, of Mt. Pleasant, South Carolina, owner of over a dozen companies involved in the scheme, for his alleged participation in a $200 million scheme related to the payment of kickbacks and bribes in exchange for medically unnecessary DME orders. The cases are being prosecuted by Assistant U.S. Attorneys Jim May and Will Lewis of the District of South Carolina. In the District of New Jersey, charges were brought against Neal Williamsky 59, of Marlboro, New Jersey, and Nadia Levit, 39, of Englishtown, New Jersey, owners of approximately 25 DME companies, for their alleged participation in a $150 million scheme related to the payment of kickbacks and bribes in exchange for medically unnecessary DME orders. Albert Davydov, 26, of Rego Park, New York, was also charged for his alleged participation in a $35 million scheme related to the payment of kickbacks and bribes in exchange for medically unnecessary DME orders. The cases are being prosecuted by Assistant U.S. Attorneys Brian Urbano and Stephen Ferketic of the District of New Jersey. In the Middle District of Florida, search and seizure warrants are being executed at 20 different business locations, including numerous DME companies and a fraudulent telemarketing company. The search and seizures are being executed by over 100 law-enforcement officers from six federal agencies, including HHS-OIG, FBI, IRS-CI, VA-OIG, SSA-OIG, and USPS-OIG. In addition to the 20 search warrants, millions of dollars and other assets tied to the conspiracy are being seized and/or frozen, including through a civil injunction naming 13 defendants as authorized under 18 U.S.C. § 1345. Any doctors or medical professionals who have been involved with alleged fraudulent telemedicine and DME marketing schemes – including Video Doctor USA, AffordADoc, Web Doctors Plus, Integrated Support Plus and First Care MD – should call to report this conduct to the FBI hotline at 1-800-CALL-FBI. Additional documents related to this announcement will shortly be available here: https://www.justice.gov/opa/documents-and-resources-april-9-2019-press-release-health-care-fraud. According to court documents unsealed today, the charges from March 2018 relate to Assange’s alleged role in one of the largest compromises of classified information in the history of the United States. New research by UNCTAD points to the potential impact of a no-deal Brexit on the UK's trading partners, including developing nations. A no-deal Brexit could damage smaller economies trading with the United Kingdom (UK), hit European Union (EU) exports hard, but bring substantial gains for China. New UNCTAD research shows the UK and its future trading partners need to expedite bilateral deals if they are to avoid the costs of exiting the EU without a deal. These costs are considerable, the research found, with the EU standing to lose out on $34.5 billion in exports to the UK. The second-biggest loser in the event of the UK’s no-deal departure from the EU would be Turkey, taking a $2.4 billion export hit. China, meanwhile, could gain an additional $10.2 billion in exports to the UK, with the second-ranked United States standing to add $5.3 billion through its exports to the UK. “Brexit is not only a regional affair. Once the UK has left its 27 European Union partners behind, it will alter the ability of non-EU countries to export to the UK market,” said UNCTAD’s director of international trade and commodities, Pamela Coke-Hamilton. The UK market accounts for about 3.5% of world trade and is an important trading partner for many developing countries. In 2018, the UK was the fifth largest importer inside the EU. It imported almost $680 billion worth of goods from the rest of the world, of which about $360 billion came from other EU countries. The UNCTAD research estimates that the largest losses would accrue to EU countries, given that they are the most economically-integrated with the UK. But other countries are also likely to see a decline in their exports, it underlines. In addition to Turkey, the research cites South Korea, Pakistan, Norway, Iceland, Cambodia and Switzerland as those at risk. The biggest beneficiaries of a no-deal Brexit, meanwhile, would be countries which current face higher tariffs. In addition to China and the US, Japan could expect to gain $4.9 billion. A no-deal Brexit is also expected to result in increased imports from Thailand, South Africa, India, Brazil, the Russian Federation, Viet Nam and New Zealand, among others. “The UK’s intention to lower Most Favored Nations tariffs would increase relative competitiveness of major exporting countries, such as China or the United States, thereby eroding market-share away from less competitive countries,” added Ms. Coke-Hamilton. But a no-deal Brexit will not only impact large economies. In the balance, smaller economies with a relatively higher level of exports to the UK market will also suffer. Many developing countries’ exports enjoy very favourable market access conditions to UK markets, largely because of bilateral trade agreements and because of EU unilateral preferential schemes. Countries wanting to retain this market access need to negotiate – and quickly – with the UK. The EU currently has about 70 trade agreements, but these are often not easy to replicate, and negotiations take time. “In many cases United Kingdom-third countries agreements, or continuity agreements, have not been signed, and there is substantial uncertainty as to whether many of these agreements will be concluded any time soon,” Ms. Coke-Hamilton advised. As of March 2019, only 26 continuity agreements had been sealed between the UK and trading partners. In a no-deal Brexit scenario, EU preferential trade agreements with third countries will abruptly cease to apply, and imports to the UK could end up taking place on Most Favored Nation (MFN) terms. This is a World Trade Organization (WTO) principle that the same tariffs must apply to any trading partner, unless there is an exception set out in an actual trade agreement. While the sums involved might appear low in value terms, the impacts on such countries would be large when measured as a percentage of their exports. “To avoid negative impacts on developing nations, the UK’s MFN tariffs on what are often key important exports from low income countries, such as sugarcane or bananas, should not be substantially reduced,” Ms. Coke-Hamilton underlined. “In these circumstances, the best response from developing countries is to accelerate negotiations to replace agreements, especially on hot issues that go beyond tariffs, including rules of origin, non-tariff measures or quotas,” she said. Ms. Coke-Hamilton added this situation was a powerful reminder to all that “unwinding economic integration is not only complex, but that doing so altogether is a bad idea”. *Pamela Coke-Hamilton is the Director of the Division on International Trade and Commodities at the UN Conference on Trade and Development. The Kingdom of the Netherlands has deposited its instrument of acceptance and Georgia and Luxembourg have deposited their instruments of ratification for the Multilateral Convention to Implement Tax Treaty Related Measures to Prevent Base Erosion and Profit Shifting (multilateral convention or MLI) with the OECD’s Secretary-General, Angel Gurría, underlining their strong commitments to prevent the abuse of tax treaties and base erosion and profit shifting (BEPS) by multinational enterprises. With its instrument of acceptance, the Kingdom of the Netherlands covers Curaçao and the (European and Caribbean parts of the) Netherlands. The U.S. Census Bureau and the U.S. Bureau of Economic Analysis announced that the goods and services deficit was $51.1 billion in January, down $8.8 billion from $59.9 billion in December, revised. January exports were $207.3 billion, $1.9 billion more than December exports. January imports were $258.5 billion, $6.8 billion less than December imports. The January decrease in the goods and services deficit reflected a decrease in the goods deficit of $8.2 billion to $73.3 billion and an increase in the services surplus of $0.5 billion to $22.1 billion. Year-over-year, the goods and services deficit decreased $1.9 billion, or 3.7 percent, from January 2018. Exports increased $6.1 billion or 3.0 percent. Imports increased $4.1 billion or 1.6 percent. The average goods and services deficit decreased $1.8 billion to $53.9 billion for the three months ending in January. Average exports decreased $1.1 billion to $207.4 billion in January. Average imports decreased $2.9 billion to $261.2 billion in January. Year-over-year, the average goods and services deficit increased $2.5 billion from the three months ending in January 2018. Average exports increased $4.5 billion from January 2018. Average imports increased $7.0 billion from January 2018. Exports of goods increased $1.8 billion to $137.4 billion in January. Exports of goods on a Census basis increased $1.8 billion. Foods, feeds, and beverages increased $1.3 billion. Automotive vehicles, parts, and engines increased $1.2 billion. Passenger cars increased $0.7 billion. Capital goods decreased $0.8 billion. Civilian aircraft decreased $1.3 billion. Net balance of payments adjustments decreased less than $0.1 billion. Exports of services increased $0.2 billion to $70.0 billion in January. Imports of goods decreased $6.5 billion to $210.7 billion in January. Imports of goods on a Census basis decreased $6.5 billion. Capital goods decreased $3.0 billion. Computer accessories decreased $0.9 billion. Civilian aircraft decreased $0.7 billion. Industrial supplies and materials decreased $2.3 billion. Crude oil decreased $1.4 billion. Imports of services decreased $0.3 billion to $47.8 billion in January. Travel (for all purposes including education) decreased $0.2 billion. Other business services increased $0.1 billion. The real goods deficit decreased $7.8 billion to $83.8 billion in January. Real exports of goods increased $3.1 billion to $149.7 billion. Real imports of goods decreased $4.8 billion to $233.6 billion. 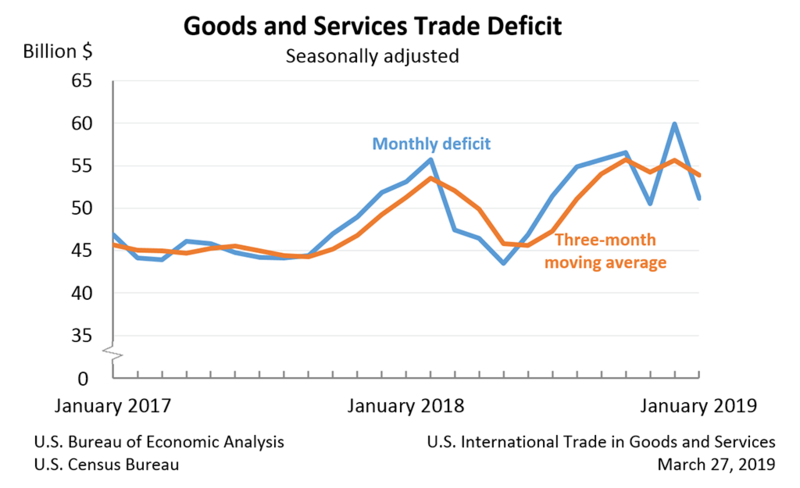 Exports and imports of goods and services were revised for July through December 2018 to incorporate more comprehensive and updated quarterly and monthly data. In addition to these revisions, seasonally adjusted data for all months in 2018 were revised so that the totals of the seasonally adjusted months equal the annual totals. Exports of goods were revised down less than $0.1 billion. Exports of services were revised up $0.3 billion. Imports of services were revised up $0.4 billion. The January figures show surpluses, in billions of dollars, with South and Central America ($4.5), United Kingdom ($2.0), Hong Kong ($1.8), Canada ($1.4), and Brazil ($1.1). Deficits were recorded, in billions of dollars, with China ($33.2), European Union ($13.1), Mexico ($7.2), Germany ($6.0), Japan ($5.3), Italy ($2.9), South Korea ($2.4), Taiwan ($2.2), India ($1.9), France ($1.2), OPEC ($0.2), Saudi Arabia ($0.1), and Singapore (less than $0.1). The deficit with China decreased $5.5 billion to $33.2 billion in January. Exports decreased $0.2 billion to $7.5 billion and imports decreased $5.7 billion to $40.8 billion. The balance with Canada shifted from a deficit of $0.7 billion to a surplus of $1.4 billion in January. Exports increased $0.4 billion to $24.4 billion and imports decreased $1.6 billion to $23.0 billion. The deficit with South Korea increased $0.7 billion to $2.4 billion in January. Exports decreased $1.1 billion to $4.2 billion and imports decreased $0.4 billion to $6.6 billion. Statistics on trade in goods and services by country and area are only available quarterly, with a one-month lag. With this release, fourth-quarter figures are now available. The fourth-quarter figures show surpluses, in billions of dollars, with South and Central America ($21.2), Hong Kong ($8.1), Brazil ($7.4), United Kingdom ($4.9), Singapore ($4.8), Canada ($1.5), and OPEC ($0.6). Deficits were recorded, in billions of dollars, with China ($102.6), European Union ($28.7), Mexico ($21.4), Germany ($16.3), Japan ($14.1), Italy ($9.4), India ($5.8), Taiwan ($3.9), France ($3.0), Saudi Arabia ($2.7), and South Korea ($1.8). The deficit with China increased $6.3 billion to $102.6 billion in the fourth quarter. Exports decreased $8.2 billion to $37.2 billion and imports decreased $1.9 billion to $139.8 billion. The deficit with Taiwan increased $1.9 billion to $3.9 billion in the fourth quarter. Exports decreased $0.7 billion to $10.6 billion and imports increased $1.2 billion to $14.5 billion. The balance with Canada shifted from a deficit of $3.4 billion to a surplus of $1.5 billion in the fourth quarter. Exports decreased $0.8 billion to $89.1 billion and imports decreased $5.8 billion to $87.6 billion. Personal income decreased $22.9 billion (-0.1 percent) in January according to estimates released today by the Bureau of Economic Analysis. Disposable personal income decreased $34.9 billion (-0.2 percent), and personal consumption expenditures increased $8.6 billion (0.1 percent). Real DPI decreased 0.2 percent in January, and real PCE increased 0.1 percent. The PCE price index decreased 0.1 percent. Excluding food and energy, the PCE price index increased 0.1 percent. The decrease in January personal income primarily reflected decreases in personal dividend income, farm proprietors’ income, and personal interest income that were partially offset by increases in social security benefit payments (related to cost of living adjustments) and other government social benefits to persons, which includes the Child Tax Credit and the Affordable Care Act refundable tax credit. In January, real PCE increased $15.6 billion which reflected a $20.8 billion increase in spending for services that was partially offset by a decrease of $7.7 billion in spending for goods (table 7). Within services, the largest contributor to the increase was spending for financial services and insurance. Within goods, new motor vehicles was the leading contributor to the decrease. Detailed information on monthly real PCE spending can be found in Table 2.3.6U. Personal outlays increased $6.3 billion in January (table 3). Personal saving was $1.19 trillion in January and the personal saving rate, personal saving as a percentage of disposable personal income, was 7.5 percent (table 1). Personal income increased $42.0 billion (0.2 percent) in February. Disposable personal income (DPI) increased $31.3 billion (0.2 percent); Real DPI is unavailable for February. The increase in personal income in February primarily reflected increases in wages and salaries, government social benefits to persons, and proprietors’ income that were partially offset by a decrease in personal interest income. Personal income (table 6) increased 4.5 percent in 2018, compared with an increase of 4.4 percent in 2017. DPI increased 5.0 percent in 2018 compared with an increase of 4.4 percent in 2017. In 2018, PCE increased 4.7 percent, compared with an increase of 4.3 percent in 2017. Real DPI increased 2.9 percent in 2018, compared with an increase of 2.6 percent in 2017. In 2018, real PCE (table 8) increased 2.6 percent, compared with an increase of 2.5 percent in 2017.